Ever wanted to check accurate CPU speed of central processing unit on the computer? 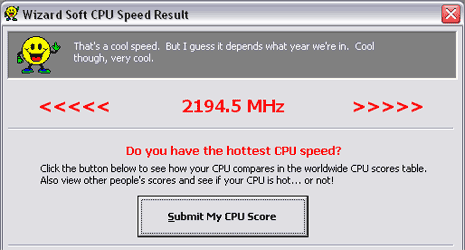 CPU Speed is a handy utility that measures and display accurate real CPU speed for Intel and AMD processing units. To get started, just download, double click to launch the utility and then click the “test my speed” button. Related – How to check CPU frequency accurately? It is recommended to close applications to get accurate measure of CPU speed of your computer. This utility will display speed in MHz (like 2195.4 MHz). Besides checking your computer CPU speed you can also compare speed results with highest CPU speed ranking worldwide. Download CPU speed to get accurate speed measure and take the guess work out!